When terrible weather hits Apple Harbor, Charlie, Pop-Up, and Dumpy rush to get ready. But they’re not the only ones who are busy-Stinky the Garbage Truck, Tommy the Tow Truck, and Big Red the Fire Engine are all out working in the storm, and Saucy Sue, a fishing boat, is stuck out to sea. 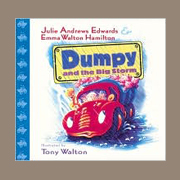 With quick thinking and teamwork, Dumpy, Charlie, and all of the trucks make their own ‘lighthouse’ on top of the bluff, and guide Saucy Sue through the big storm. Julie Andrews Edwards is one of the most recognized figures in the world of entertainment. Perhaps best known for her performances in Mary Poppins, The Sound of Music, and Victor/Victoria, Julie is also the author of several favorite children’s books, including Dumpy the Dump Truck, Dumpy at School, Dumpy and His Pals, Dumpy and His Friends on the Farm, and Little Bo: The Story of Bonnie Boadicea. Emma Walton Hamilton is a Founder and Co-Artistic Director of Bay Street Theatre in Sag Harbor, New York, where she lives with her husband and young son, Sam, whose passion for trucks was the inspiration for this series. Tony Walton, winner of three Tony Awards, an Emmy, and an Oscar, is a world-renowned set and costume designer for the theater and film. Mr. Walton’s nostalgic artwork evokes the beauty of the American farm and lends a classic feel to the Dumpy books. Get Free Tips & Strategies on How To Write A Children's Book and Get It Published!